Flax may be infested from the time of emergence to maturity by various insect pests. To keep damage low, fields should be examined regularly, and controls applied when infestations reach the economic threshold. The following species are potentially damaging but often occur in too low a number to cause economic loss. Flax bollworm, Heliothis ononis (Denis & Schiffermiller), is a climbing cutworm. Flax is the only crop it attacks. The moths deposit their eggs in the open flowers, and the young larvae eat the developing seed within the boll. 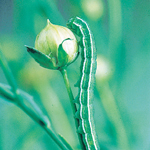 The older green and white striped worms leave the boll and complete development by feeding on other bolls from the outside. 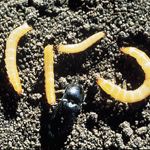 Economic infestations of this pest have been limited so far to west central Saskatchewan. Grasshoppers are a hazard to flax. Young grasshoppers may attack young plants and cause damage. However, more damage is done to the crop before harvest by the older, larger grasshoppers. They can quickly cause large numbers of bolls to drop by chewing through the more succulent portions of the stem below the bolls. 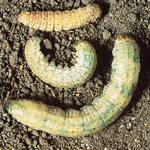 Two subterranean species of cutworms, the redbacked, Euxoa ochrogaster (Guen. ), the pale western, Agrotis orthogonia (Morr. 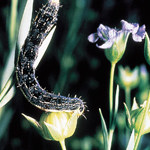 ), and the early cutworm, Euxoa tristicula, attack flax. 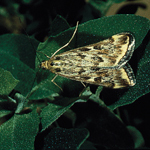 The adult moths of these species lay eggs on the soil surface in weedy summerfallow fields during late summer. These eggs overwinter and the young larvae feed on flax seedlings in the spring. 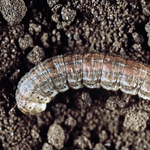 Cutworms usually remain below ground, cut off the young plants near the soil surface and draw them down where they are eaten. An average population of 12 redbacked cutworms/m2 (10/yd.2) can cause a 10% reduction in the yield of flax, and control should be considered. 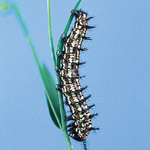 Larvae of the army cutworm, Chorizagrotis auxiliaris (Grote), damage flax and many other crops by feeding on foliage in the spring, and to a lesser degree, in the fall. It is an important pest in southern Alberta and, to a lesser extent, in southern Saskatchewan. Populations of 10 or more larvae/m2 (9/yd.2) can cause significant damage. 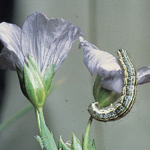 The bertha armyworm, Mamestra configurata (Walker), was a regular pest of flax before canola and mustard were grown on the Prairies. However, since the widespread introduction of the Brassica crops, the bertha armyworm rarely causes economic damage to weed-free flax fields. If bertha-armyworm-infested canola fields are swathed and green flax fields are nearby, the flax can then suffer significant damage from invading larvae. When abundant, bertha armyworms cause serious damage by chewing through the stems below the bolls causing them to drop to the ground. Young bertha larvae are green but larger larvae are usually velvet-black. The beet webworm, Loxostege sticticalis (Linnaeus), is a slim, active, dark-green caterpillar which eats leaves, flowers and patches of bark from flax stems and branches. Localized areas can suffer severe damage. Determine if a significant number of bolls are being damaged before applying control. One species of aphid, Macrosiphum euphorbiae (Thomas), commonly occurs in flax and can significantly reduce yields. Aphids fly into fields early in July, and reach peak densities in late July or early August. This pest uses its mouthparts to pierce and extract sap from stems and leaves. If aphid densities exceed three per plant when the crop is in full bloom, or eight per plant at the green boll stage, insecticidal control is cost effective. At least 25 plants in different parts of the field should be checked for aphids to determine if the economic thresholds are exceeded. If no action is taken when aphids exceed the thresholds, 5-25% or more of the yield may be lost. The aster leafhopper, Macrosteles quadrilineatus (Fbs. ), and the tarnished plant bug, Lygus lineolaris (Palisot de Beauvois), can also damage flax. 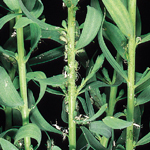 These insects, like aphids, feed by sucking juices from the flax plants. Leafhoppers can carry aster yellows mycoplasm and also crinkle virus, and can infect the plants with these diseases while feeding. 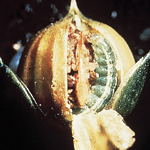 Tarnished plant bugs damage flax by feeding on the growing tips, which become distorted and die back. The damage from these insects is most serious on late-seeded crops. A climbing cutworm, Polia lilacina (Harv.) has been widely distributed in flax fields in Saskatchewan and Alberta but apparently has not caused significant damage. The zebra caterpillar, Ceramica picta (Harr. ), is another species which feeds on flax as well as many other crop plants. This is not normally a significant pest. 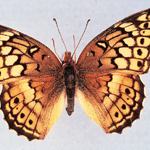 The adults and larvae of the variegated fritillary, Euptoieta claudia (Cram. ), have been recorded on flax. However, this insect is usually not sufficiently abundant to cause economic damage. Current recommendations for chemical control of insects of field crops are published annually by most provinces. For more information on insects and their damage, and for up-to-date information on control, consult district agriculturists, agricultural representatives or provincial entomologists. Labels on pesticide containers also provide essential information on application procedures and pesticide safety, and should be followed closely.